I bought the 14 books of the Dresden Files from Audible.com and listened to them using the Audible iPhone app and my iPhone. I ran out of books in my waiting list and decided it was time to re-listen to all of the Dresden Files books, one after the other as quickly as time would allow. What a ride. Taking the series in like this was great, it was like having one extremely large book to listen to with no interruptions. Butcher has created a universe and characters that I will never forget. The 14 books are not of equal quality, but all of them are very good with a few of them rising to real greatness. The audiobooks are narrated by James Marsters, with one glaring exception, and now when I read a printed book I hear all of the characters, as they are portrayed by Marsters. James Marsters IS Harry Dresden! "Ghost Story: Book 13" is narrated by John Glover, he does an admirable job, but he sounds to much like the guy who used to narrate the Disney movies trying to be something that he isn’t. I hope one day Marsters is able to re-record the book as it should have been done in the first place. 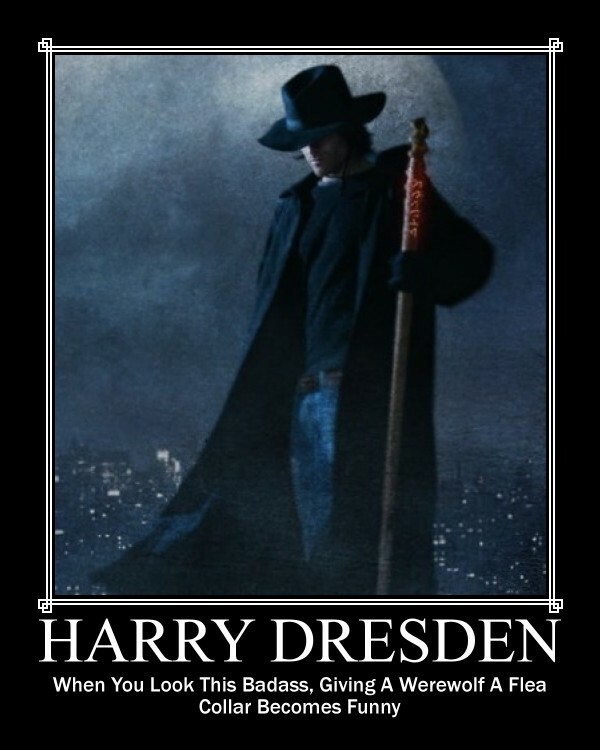 I look forward to reading another 14 books in the Dresden Files and hope that they come quick! Harry Blackstone Copperfield Dresden is a fictional detective and wizard. He was created by Jim Butcher and is the protagonist of the contemporary fantasy series The Dresden Files. The series blends magic and hardboiled detective fiction. In addition to the fourteen The Dresden Files novels, he has appeared in five published short stories and several unpublished short stories, as well as a limited series comic and an unlimited series comic. He was also adapted into a character by the same name for the TV series version of the novel series, also called The Dresden Files. I rate the first 14 books in the series as a 9 and recommend them to ANYONE! Storm Front, the first in the series, is a masterpiece. Posted in Books, Fiction, Happy. I bought this signed hardback from Powell’s Book Store in Portland Oregon. I have been hearing a lot about this book from every direction. Audible, Amazon, and a lot of friends have pushed it at me. But I wasn’t impressed by any of them; most of the time when a writer is unable to get a story published it is for a good reason. Wool is an exception, at least the story as a whole is, I am not sure I would have made it much past the first section of the book if I had to wait for the next section to come out. I want to say a big thanks to all of the people that encouraged Hugh Howey to keep writing. 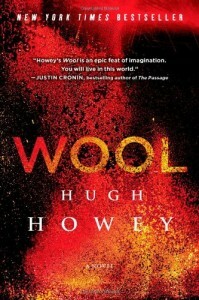 I enjoyed reading Wool, enough so that I stayed up all night reading it. The entire time I was reading Wool I couldn’t stop thinking about the "Fallout" series of video games. In Fallout the player begins in a "Vault" which is like the Silo in Wool, the similarity is impossible to ignore if you have played the game. It was not a book that blew me away. I really enjoyed it, but it didn’t have a lot of "WOW" factor. Nothing that got me really excited. His fateful decision unleashes a drastic series of events. An unlikely candidate is appointed to replace him: Juliette, a mechanic with no training in law, whose special knack is fixing machines. Now Juliette is about to be entrusted with fixing her silo, and she will soon learn just how badly her world is broken. The silo is about to confront what its history has only hinted about and its inhabitants have never dared to whisper. Uprising. I rate this book an 8 out of 10 and recommend it to anyone looking for a solid science-fiction apocalypse story. I am not sure where I bought this hardback book, probably Amazon or Barnes & Noble. I read it here and there over a couple of months, it took awhile between everything else that has been going on. 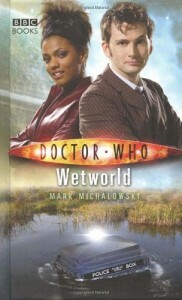 Wetworld features 2 of my favorite characters, David Tennant as the 10th Doctor and Freema Agyeman as Martha Jones. The story itself is really cookie-cutter. The companion wants to go some where/some when, the Doctor agrees while totally misinterpreting the where and when, and the TARDIS takes them to someplace that neither one of them expects. Something is wrong endangering the locals of where they land. The companion gets in trouble, the Doctor runs around acting manic, and with the help of the locals everything gets straightened out. But I still enjoy reading these stories, especially the Dave Tennant stories. If you like Doctor Who novels, this one will not disappoint. When the TARDIS makes a disastrous landing in the swamps of the planet Sunday, the Doctor has no choice but to abandon Martha and try to find help. But the tranquillity of Sunday’s swamps is deceptive, and even the TARDIS can’t protect Martha forever. The human pioneers of Sunday have their own dangers to face: homeless and alone, they’re only just starting to realise that Sunday’s wildlife isn’t as harmless as it first seems. Why are the native otters behaving so strangely, and what is the creature in the swamps that is so interested in the humans, and the new arrivals? The Doctor and Martha must fight to ensure that human intelligence doesn’t become the greatest danger of all. Featuring the Tenth Doctor and Martha as played by David Tennant and Freema Agyeman in the hit Doctor Who series from BBC Television. I rate this book an 8 out of 10 and recommend it to any fans of Doctor Who. I read this book on Safari Books Online using the Safari Books app on an iPad. I am not a big fan of using flash in the type of photography I usually do, but I am trying to improve my skills with speedlites and strobes. I have an old Canon 550EX and a pair of Yongnuo cheapo flashes with Yongnuo wireless triggers. The Yongnuo flashes work great when I have a lot of time to set them up and experiment with settings since everything is manual with them. But where the Canon flash is 95% reliable the Yungnuo flashes are more like 75% reliable, so they get the job done, I just have to pay closer attention to them and double-check every exposure. So that is where my interest in this book began, but this book delivers so much more than what to do with your flash. The first 5 chapters are about how to see and capture light and are absolutely fantastic, a must read. It is so well written, where the book "Light Science and Magic" feels like reading a schoolbook, the Speedliter’s Handbook is much friendlier and more conversational. I really enjoyed it and expect to read it again and again until I have soaked it all up. In the appendix of the book is a great resource of websites about photography, I filled up my news reader with more than a dozen of them. Getting your Canon Speedlite to produce the light you need can be a real challenge. For those new to flash photography—or for anyone who has previously given up out of frustration—Speedliter’s Handbook is a revelation. Photographer Syl Arena takes you on a journey that begins with an exploration of light and color, moves through a comprehensive discussion of the Canon Speedlite family and all of the accessories and equipment available to the Speedliter, then settles down to crafting great light in one photo shoot after another. Whether you want to create a classical portrait, shoot an event, or simply add a little fill light to a product shot, Speedliter’s Handbook shows you how. Whether you’re shooting portraits, events, or sports, Speedliter’s Handbook is an essential resource that teaches you how to craft the light you need for any type of shot you want. I rate this book a 9 out of 10 and recommend it to any photographer. Posted in Books, Non-Fiction, Photography. I bought this audiobook from Audible and listened to it using the Audible app on my iPhone. With such high ratings and the endorsement from Neil Gaiman, how could I pass this one up. I am not sure why, but this book just didn’t work for me. It started out with many small technical problems with the audio, small chirps and crackling, that really distracted me. But even after those issues went away later in the book I still just couldn’t get into it. The lead character, Tom Carmody, never appealed to me… The book just feels pretentious to me with all the armchair philosophy, puns, and forced wordplay. I can see how this book would be viewed as a precursor to Douglas Adams’ Hitchhiker series, but Mr. Adams was able to do it without pretension, he did it in a way that made it feel natural in a way I do not feel like this book does. 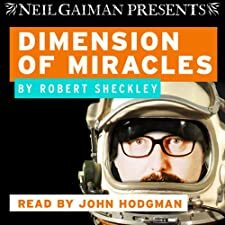 John Hodgman does a good job narrating the book, but it is hard for me to judge as I never could get really involved with the storyline. I really respect Neil Gaiman and Audible for making audiobooks like this one of stories and authors that many of us have never heard of and look forward to many more of them. Award-winning author, narrator, and screenwriter Neil Gaiman personally selected this book, and, using the tools of the Audiobook Creation Exchange (ACX), produced this work for his audiobook label, Neil Gaiman Presents. A few words from Neil on Dimension of Miracles: “Dimension of Miracles is probably not [Sheckley’s] most famous book…. but I think it’s probably his best-loved book. It’s about the joys and tribulations (mostly the tribulations) of winning the lottery—the galactic lottery—accidentally. And wrongly. Tom Carmody is awarded a remarkable prize, is taken half way across the universe to collect it, finds himself hopelessly lost, and needs to find his way home again to Earth…to this Earth, not an alternate, weirdo Earth. He’s got to get back. And the price is high. In its style of humor—and even in some of the jokes—Dimension of Miracles is very obviously a precursor of Douglas Adams’ Hitchhiker’s Guide to the Galaxy. Douglas actually hadn’t read Dimension of Miracles until very shortly after Hitchhiker came out, when people pointed him to it, and he told me that he found the experience almost shocking—it was like reading himself. He was a huge admirer of Bob Sheckley and a huge admirer of this book, and in later life, I had the privilege of introducing both of them. Dimension of Miracles is a satirical science fiction novel first published by Dell in 1968. It’s about Tom Carmody, a New Yorker who, thanks to a computer error, wins the main prize in the Intergalactic Sweepstakes. Tom claims his prize before the error is discovered and is allowed to keep it. However, since Tom is a human from Earth without galactic status and no space traveling experience, he has no homing instinct that can guide him back to Earth once his odyssey begins – and the galactic lottery organizers cannot transport him home. Meanwhile, his removal from Earth has caused a predatory entity to spring into existence – one that pursues and aims to destroy him. Carmody is on the run, and he ends up transporting from Earth to Earth – different phases and realities of the planet, which of course is not the time or condition he expects. I rate this book a 5 out 10, it just didn’t work for me.